By Belinda and has no comments yet. 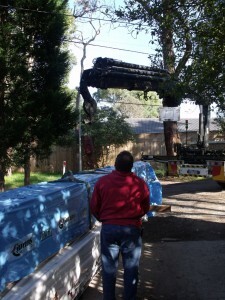 Aside from the joy of the wood finally arriving today I also had 7 tradies come to quote jobs. 4 flooring guys, 2 plasterers and a plumber. 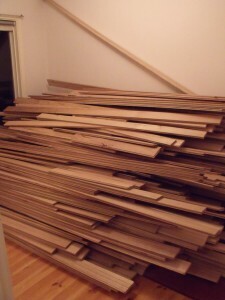 We’ve chosen our flooring man and now just need to source the Form Ply to go underneath the floorboards. I must say that I do enjoy demolishing things!! Had a wonderful time today ripping up lino and pulling off skirting boards.. hehe! Cant wait to get stuck in to the garden.. but that will have to wait!